This last year BuildAModule.com powered numerous free Drupal trainings around the world. This week, we're officially releasing a suite of translation tools that will allow the videos on BuildAModule.com to be translated into any language. These translated videos can form the core curriculum of free community-driven Mentored Trainings in locations where English isn't widely spoken, or where training materials in a native language will help speed up the learning process. During our beta testing last week, translators made major contributions to the Spanish translation with over 40 videos translated, and there have been contributions in Dutch, Italian and Danish as well. Why did we build these translation tools? Shortly after releasing our first video collections last year, we had several requests for translations, and for the tools to help our viewers translate videos themselves for other speakers of their native languages. We've also heard repeatedly that there is a need for Drupal training materials in other languages. With our free Mentored Training model, it made sense to take the time to build translation tools since the translated videos can have such a broad impact on spreading Drupal and helping large groups of individuals learn Drupal quickly. Every video can have its transcript and title translated. Once translated, the translated video also becomes searchable in that language. If you are comfortable with English and another language you'd like to translate to, you can definitely contribute. Even translating one video helps, though we've heard from translators that it's a little hard to stop once you get started. Just send us an email with the language you'd like to translate to, plus a little bit about yourself and why you want to translate, and we'll set you up with the tools you need to get started. Want certain videos translated for an upcoming training? As a translator, you decide what videos you want to translate. We have a protocol to help people make sure they don't accidentally translate something that's already being translated, but if you want to focus on the Views or jQuery videos, for example, that's perfect. If you have a need to translate certain videos, it's even more likely that other people have the same need. You can also post translation requests in the BuildAModule.com forums to let others know that you're interested in certain translations, even though you may not be able to participate directly. Below are two videos, one of which shows a video that has been translated into Italian, and the other which demonstrates how to use the translation tools, so you can see how they work. Just go to https://buildamodule.com/translate, or send us an email with any questions you have. We hope that opening up these translation tools will help the international community build some of the much-needed resources it needs for effectively conducting Drupal training in a variety of native languages. If our downloads are attractive because you watch video on the go or use your iPad as a second monitor while you're working through the examples on BuildAModule.com, then we have some good news! iPad 3's will now play our crystal-clear high definition videos quite nicely. If you've been holding out on purchasing a download, we're throwing in a little discount as an incentive. Just use the code IPAD3HD when checking out to get 15% off all high definition downloads. Want to help test our new translation tools? If you speak multiple languages and are excited about the idea of BuildAModule.com videos being translated into another language, then we'd love it if you'd give our translation tools a try to give any feedback before we officially launch them. If you're interested, simply respond to this newsletter with a little information about why you might want to help translate, and what language you'd like to translate to. Last week we looked at using strings, and this week we learn how and why to wrap up a string in a variable. We also explore a couple other types of variables that you'll frequently encounter when writing your own code and working with Drupal. For this video, we continue exploring useful string functions, like functions that trim extra spaces off of a string, or tell you how long a string is. Knowing what functions are in your arsenal is important, but knowing how they're used in the real world will expand your ability to write effective code. So, we step back in this video and look at reasons we might want to use the functions we just explored. Running into errors is a very normal part of writing code, but it can be frustrating if you don't know where to look to fix it. In this video, we walk some of the errors that are caused when you've missed a little something in your code. Last week we worked on setting up our development environment using Dev Desktop. This week we start actually diving into code! We start by exploring the structure of a super simple PHP script, and move on to discuss how to work with strings and variables of different kinds. For those of you just starting with PHP, this is a great place to jump in. One confusing point for those new to PHP is how extra space and new lines impact how the code runs. In this video, we talk you through exactly what to expect from white space. Strings are an essential component of working with content in PHP. In this video, we show you the nuances of using and manipulating strings in your code. Once you have the concept of strings down, you have the basis for understanding what a variable is and how to use one in your code. This will set the stage for next week, where we talk about many of the other types of variables you'll be using in your code. We actually have two free videos rolling out this week! In this video we walk you through a simple script in the PHP language and talk about how you tell the PHP application that you want to use PHP instead of HTML. At this point in the videos we start using a different text editor called an IDE, or Integrated Development Environment. Using an IDE can help you catch errors in your code and help you dig deeper into existing code. In this video, we explain the benefits of using an IDE instead of a simple text application. Our next collection starts releasing next week! This week we wrap up our Change Management and Version Control collection. This collection was a lot of fun to do, and many of our viewers have expressed that it's been their favorite so far. While it might seem a little sad, finishing up one collection also means something awesome: we're about to start releasing a new collection, and next week we'll release the first two videos as a teaser. Are you excited? Me too. Want to know what the collection is about? Stay tuned next week! To celebrate this slew of awesomeness, we're also offering a special 25% off the Change Management and Version Control series as a download or DVD. To claim the discount, just use the code CMAVCDONE when you check out. The Drush sandwich command is a built-in example of extending Drush, and though it may be a little contrived, and completely inedible, it serves as a great example of how we can add new, useful commands to Drush. In this video we install it and give it a run. In this video we break down the components of the Drush sandwich example and pull out the pieces we need for the next video. Before we wrap up this series, here's a nice demo of two additional Drush utilities - the ability to run SQL queries through Drush and modify variables in the variables table. Creating your own Drush commands can be very empowering and increase your productivity significantly. Plus, it's a great way to get some street cred with other command line nerds. We walk through the process of adding our command in this videos. Post-DrupalCon sale, get 20% off everything! To redeem your discount, just use the code POSTDC2012 when checking out. Enjoy! 5 more videos from PHP Programming Basics released FREE! In these introductory videos, we learn a bit about the stack of technology needed to get your PHP scripts to work. For quick and easy installation, we're using Dev Desktop. Even though our examples don't use Drupal directly, Dev Desktop will help you later on as you start to dive into the Drupal examples. Understanding what each part of the AMP stack does is an important foundational step in PHP programming. In this video, we briefly explain what each part of a typical stack is for. To set up our development environment, we're using an application from Acquia called Dev Desktop. In this video we show you how to install it on a Mac. In this video, we demonstrate installing Dev Desktop in a Windows environment. Dev Desktop comes with the ability to quickly spin up Acquia's distribution of Drupal, but it's also good to know how to get the default version of Drupal running. Even though the examples aren't going to be using Drupal directly, this is an important piece of working with the Dev Desktop stack, and it sets the stage for where we put our PHP examples. In this video we set up the folder we'll be using for our examples and test it out with a simple, HTML-based web page. Don't worry, we'll be getting into the PHP soon! Did you know every video is transcribed? If you're not a member yet, you might not know that every video on Build a Module.com has been transcribed. When you log in with a membership account, you will see a 'transcript view' on the right hand side of the video that allows you to read ahead and to navigate to different parts of the video by simply clicking on the text. Our members love this feature because of the time it saves and the additional insight it gives to the content. It also makes it possible to quickly scan or read through a video without watching it in a traditional sense. On the video index page on Build a Module.com, the sheer number of links can be overwhelming and a lot to scroll through. This last week we added a oft-requested feature that allows you to show just the collection you're working on and hide all the rest. To use it, just over over the collection and click the green tab that displays above the collection title that says "Show just this collection". Without programming experience, jumping the gap from Drupal site builder to developer can be incredibly tricky. We've heard from many of our viewers that there's a need for a solid resources focusing on PHP basics, and we're happy to announce that our next collection does just that. Learn PHP from scratch (no experience necessary)! Tons of tips and tricks for organizing code and logic! 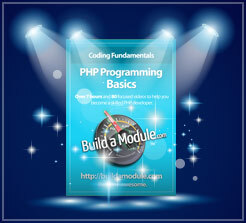 In PHP Programming Basics, we begin with the building blocks of PHP programming, including working with strings, variables, arrays and objects. We then start to manipulate these with useful, native PHP functions (it's okay if you have no idea what that means). Once we have the basics down, we begin writing our own functions and building up simple, fun and practical scripts to develop a feel for the architecture behind a typical PHP application. In our final example, we bring everything we know together to build our own CMS platform. Even though many developers end up using Drupal, several began the process by building their own CMS, and the experience has given them tremendous insight into how the Drupal architecture works and how to manipulate it. In this series, you'll fast-forward through this process and develop an understanding of the robust structure of Drupal while honing your new PHP skills. Our first two intro videos released FREE! In this video we introduce you to the new collection and give you a preview of what to expect throughout the series. This video is a must-see if you're new to development. In it, we give you an approachable way to think about programming, and give you some ideas for getting the most out of the extensive examples used throughout the series. Come see me at DrupalCon! If you're at DrupalCon, there's still a lot of fun left to be had. And, if you want to say hello and share some ideas you have for Build a Module.com, or just shoot the breeze, there are a couple places you can find me. Wednesday 1-2pm I'll be giving my talk Building Beautiful, Dynamic Forms in Drupal 7 in room 401. If you're trying to improve any of your Drupal user interfaces to be more usable and fun, there are some great tips in this talk. Wednesday 3:15-4pm I will be signing DVDs at the DrupalCon bookstore. Feel free to stop by just to say hello, even if you don't have one. DVDs will be for sale, but come by even if you don't plan on picking one up. I'll be giving away some "Become awesome" stickers as well. For those sprinters who need a little background on various aspects of Drupal, be it awesome APIs, the theme layer or even basics like how taxonomy works, there's likely a video available on Build a Module.com to help them learn it. Sprint organizers can delegate to these videos when they don't have the time to directly mentor their sprinters, which in turn should help maximize the amount of work that gets done. Would-be sprinters who weren't able to make it to DrupalCon this year can still spend some time on the sprint day helping out, and since they won't have access to the direct mentorship that's available at the sprints, they can still ramp up on important Drupal skills - enough to make a valuable contribution. To get a free pass to Build a Module.com, just go to https://buildamodule.com/free on Friday, March 23th, create an account if you don't have one, and click the button to get a free 24-hour pass. If sprinters or sprint organizers have any questions, please feel free to send them my way. I will be walking around, sometimes maybe with a giant backpack with a flag. Feel free to stop me and say hi anytime. All day training - Of course, most of you have heard that I will be conducting a full-day training along with 10 (yes, 10!) other amazing, experienced, wonderful Drupal trainers. If you haven't signed up, and are at least a little interested, take a minute to read through the description and watch the video. 1:00 - 2:00pm - Watch me present Building Beautiful, Dynamic Forms in Drupal 7. In it I'll walk you through a ton of technical tips for making forms more usable and fun in Drupal. 3:15 - 4:00pm - I will be doing a DVD-signing at the DrupalCon Bookstore. If you want to say hi, get a DVD signed, grab a "Become awesome" sticker, or just lurk about, please come! I and several other folks who have conducted Mentored Trainings will be getting together for a Birds of a Feather (BoF) to discuss some ideas. If you're interested in conducting one yourself, or you want to give your 2 cents, keep an eye on the BoF schedule. I will also be sure to tweet about it, so feel free to follow us on Twitter. Isn't it a pain to have to fire up the Drupal user interface every time you want to track down some recent activity in your Drupal logs? And your also a little limited in your ability to filter messages and control the type of output. Well, in this video we show you how Dush makes this quick and easy. Being able to run your own PHP on a Drupal installation on the fly is something that Drupal users have found all kinds of kludgy ways to do, but Drush makes it painless and extensible, and we'll show you how. Sure, you can wade through clunky forms and exhaust your mouse-clicking finger adding new users, blocking your spammers and pruning those old accounts. Or, you can watch this video and learn a set of more more rapid user management tools that may win you some geek points with command line enthusiasts. Access to 10 amazing Drupal mentors, including developers, themers and information architects. The training is an affordable $350 with a $25 rebate for higher education students and faculty. I'd love to see you there, and if you have any questions, feel free to send me an e-mail. Drop Labs is an innovative all-Drupal co-working facility in L.A., and now members can get free access to the full Build a Module.com video library when they come in to work. If you haven't heard of Drop Labs, definitely check them out. The Drupal Association announced a "Drupal Days" initiative a while back to help support a quarterly day-long slew of low-cost Drupal training worldwide. We think this is awesome! 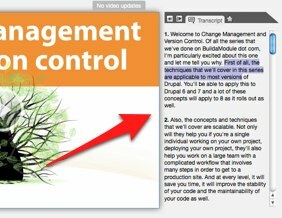 But for those of you who aren't necessarily trainers (or for whom training isn't a whole lot of fun), you can still help people learn Drupal with the Mentored Training model. We offer a free 8 day pass to your students, and all you need to do is hang around while students watch videos and help them answer questions. It's also pretty easy to rope other Drupalists to help out since there's no prep work required. We've had mentored trainings happen across the world with unanimous success. If you're interested in participating in Drupal Days by putting on a Mentored Training, please check out the details. Last week we talked about the benefits of using Drush Make to build reliable site scaffolding, and this week we dive into how to actually create and run a Make file, both from scratch and also using an existing Drupal installation as a starting point. In this video we walk through the architecture of a Drush Make file and build one from scratch. Then we use it to create site scaffolding for a new Drupal site. Knowing how to build a Drush Make file from scratch is handy, but the online tool, drushmake.me, is a rapid method that acts as a nice checklist to insure you get all the modules and components you need. In this video we walk you through the interface. Drush Make comes with a nice little utility that will generate a Make file based on a current Drupal installation. It's not perfect, but it will save you a ton of time if you're switching over to Make from a copy-and-paste system. Come to DrupalCon and get amazing training! We've already sold a number of seats to our DrupalCon Denver mentored training, but there's still some seats left if you're looking for an opportunity to ramp up on some Drupal before the Con. We're going to have a small army of skillful mentors, ready to help you with your questions, and a curriculum where you can go at your own pace - learning exactly what you need to. Learn more about our DrupalCon training, or click here and scroll down to register. This week we dive into some awesome tools for Drush, including using local and remote site aliases (ie. control a remote site with your local Drush installation - awesome!). We then move on to look at using Drush Make - a handy Drush contributed module and extension - to streamline the process of setting up site scaffolding. This is some pretty fun stuff! In previous videos we looked at setting up a Drush configuration file to work with a single site. In this video we show you how to set it up to work with any site on your local machine. Working with local site aliases is great, but the real power comes from using remote aliases. With a remote alias, you use your local Drush installation to control remote sites. It takes care of logging you into SSL and navigating to the right folder, you just pass it an alias and a command, and your 're good to go. In this video we talk about the sticky points in creating a portable, re-usable site scaffolding to begin your projects with, and how a nice little contributed module and Drush extension called Drush Make can make the process simple and less error-prone. Installing a Drush extension is pretty straightforward, but in this video we show you how by installing Drush Make. Drush aliases are shortcuts that allow you to run a Drush command on a particular local site regardless of where you are on the command line. This can be a nice little productivity boost, and in this video we show you how to set it up.